We’d love your help. Let us know what’s wrong with this preview of Nero Nights by Keary Taylor. But maybe the crash was a blessing in disguise. They’ve seen their entire live Nova and Valen barely escaped Isroth with their lives and now they’ve crash-landed on an empty planet—no people, no tools to fix their ship. Nova has spent her life building and creating mechanics, but this is the most advanced vessel in the galaxy, and she can’t figure out what’s wrong with it. To ask other readers questions about Nero Nights, please sign up. Nero Nights is Episode 5 of this series, and it is great. Each episode is better than the last, and develops more than the previous episode. I absolutely love following Nova and her journey. There are ups and downs, twists and turns, and the characters are amazing. Nero Nights is a bit slower pace than the previous four books, but it's none-the-less, still an important part of the series. Nova and Valen have found themselves on a planet that seems to be completely empty. They have no idea where they are and the ship they stole isn't working. These two find themselves in a state of do we just stay here and avoid the chaos what was there lives or do they try and fix the ship and continue what the had started? Keary does a phenomenal job of keeping this episode just as enticing as the others without the action and drama of the war added in. Nova and Valen never really got to know one another and Keary delves into the aspect very well without having them move at lightening speed. While we learn a bit about Nova and Valen, we're given very little about what is happening back on Isroth or their friends. I love that Keary gives us just enough new information that we are left with bated breath to see what happens in the next episode. While this one isn't as action-packed, I still found myself glued to the pages and enjoying the developments between Nova and Valen. A really good episode to help strengthen the overall plot and allow us to understand Nova and Valen together a bit more. What can I say about the Neron Rising series, apart from it just gets better with each episode. The whole story pulls you in from start to finish, from the worlds the author has created to the fascinating characters she is telling the stories of. I find myself not being able to put the stories down until I've read the whole thing and then desperately wanting more once it's over. Even though this story has a must slower pace than the previous episodes in the saga, it was nice to finally delve dee What can I say about the Neron Rising series, apart from it just gets better with each episode. The whole story pulls you in from start to finish, from the worlds the author has created to the fascinating characters she is telling the stories of. I find myself not being able to put the stories down until I've read the whole thing and then desperately wanting more once it's over. Even though this story has a must slower pace than the previous episodes in the saga, it was nice to finally delve deeper into the characters of Nova and Valen, and the developments in their relationship. I'm sure this story was a nice reprieve for what is bound to be an explosive journey. In this episode, Nova and Valen have punched a hole in space and crashed on a planet god knows where. With Valen still struggling to lose the grip of wanting to return to Cyrillius, Nova must find a way to break the hold of the Kinduri. With a damaged ship, they are almost blissfully unaware of what is going on in the rest of the galaxy. So we're already on episode 5 of the Nero saga. I say episode because that's exactly what this series feels like, it's like waiting on another episode of one of your favourite show and you're not disappointed when it eventually lands because it's always worth the wait. Things aren't looking good for Nova and Valen, a desperate escape from Cyrillius lands them halfway across the galaxy with nothing but a broken ship. While this episode is slower it's exactly what is needed to build the relationshi So we're already on episode 5 of the Nero saga. I say episode because that's exactly what this series feels like, it's like waiting on another episode of one of your favourite show and you're not disappointed when it eventually lands because it's always worth the wait. Things aren't looking good for Nova and Valen, a desperate escape from Cyrillius lands them halfway across the galaxy with nothing but a broken ship. While this episode is slower it's exactly what is needed to build the relationship between Valen and Nova, I loved that character development and them finally getting some alone time together to get to know each other. This review has been hidden because it contains spoilers. To view it, click here. This book was different than the first books in the series in the way that it feels like the tides are turning. I feel that the story was a perfect balance of movement towards the future and experiencing the present moment. I found myself predicting the future of the next episodes to help decrease the uncertainty of what may or may not become. I appreciate the level of the relationship between Nova and Valen and how they allowed each other to finally be open and honest with each other, no holdin This book was different than the first books in the series in the way that it feels like the tides are turning. I feel that the story was a perfect balance of movement towards the future and experiencing the present moment. I found myself predicting the future of the next episodes to help decrease the uncertainty of what may or may not become. I appreciate the level of the relationship between Nova and Valen and how they allowed each other to finally be open and honest with each other, no holding back. I am hopeful to hear more about this new bond between them that had left them both glowing. This review has been hidden because it contains spoilers. To view it, click here. After Nova and Valen make their escape from Isroth, they find they have crashed on a isolated, deserted planet. They make the trip in a matter of minutes compared to months. Which is strange. Due to their crash landing, there are repairs to be made if they are going to get back to Nova’s “family” and kill Cyrillius. While working on the ship Nova and Valen need to find food and water to survive. During this time Nova and Valen get to know each other better as well. Nova finally has the ship repa After Nova and Valen make their escape from Isroth, they find they have crashed on a isolated, deserted planet. They make the trip in a matter of minutes compared to months. Which is strange. Nova finally has the ship repaired however her and Valen have reservations about leaving the planet they have been living on for months. Nova and Valen hear the podcast from Arden Black. The news is not good. With a decision being made, they crank up the ship to find out what happened to the rest of the crew and help the galaxy from Cyrillius tyranny. Once the ship comes to life, they know what they need to do...meet with Arden Black face to face. Nova and Valen believe with Arden’s help, they can get more recruits to help take down Cyrillius. After the meeting, Nova and Valen get ready to take off to Valen’s planet when they get a communication from Edan. Nova and Valen finally find that time alone together, stranded on an unknown planet since they busted the revolutionary ship upon their escape from Cyrillius. Lucky they have an experienced mechanic and engineer in Nova. I'm remiss in that I've never commented on my other reviews how I enjoy her trade, especially since in a lot of books the women are characterized as helpless. The beginning of this short story starts out slowly in my opinion and really doesn't progress the overall story until the end which I found a little frustrating. I think it's the author's way of trying to get readers to buy into Nova's and Valen's relationship and to shift to an understanding of who Valen really is outside of Cyrillius's influence. Nero Nights is the 5th installment in author Keary Taylor's Neron Rising series. This time, Valen and Nova are living out their predestined dream on a desolate and lonely planet. Living day by day and learning more about each other as they try to fix their broken space vessel proves to be quite challenging for the couple. 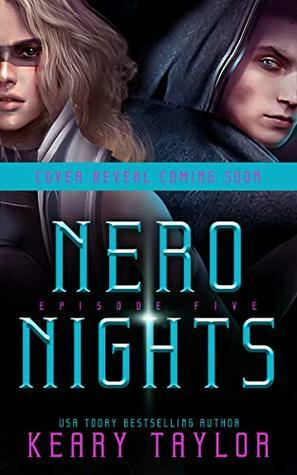 As mundane as catching food and foraging for berries, their constant struggle between wanting to go back to their old lives to trying to fulfill their destinies together become Nero Nights is the 5th installment in author Keary Taylor's Neron Rising series. This time, Valen and Nova are living out their predestined dream on a desolate and lonely planet. Living day by day and learning more about each other as they try to fix their broken space vessel proves to be quite challenging for the couple. As mundane as catching food and foraging for berries, their constant struggle between wanting to go back to their old lives to trying to fulfill their destinies together becomes a constant mental tug of war. In this episode, we get a deeper glimpse into the minds and hearts of Valen and Nova. While Valen struggles to be released from his hold from Cyrillius and Nova tries to clear the cobwebs between her dreams and reality, this young couple must overcome their own inner monsters to find the strength to conquer the bad guy once again. Nero Nights is sort of an in-between story. I have a feeling things will go back to the rollercoaster ride that Keary is so adept at putting us in! Be sure to read all of the installments so that you get a clearer idea of the story and the characters. Episode five of The Neron Rising Saga successfully topped the first four episodes, which was difficult to do, because I loved the first four episodes, but top them it did, because Taylor took a step back from the action scenes to let us inside the heart of the story. Shipwrecked, Nova and Valen find themselves physically removed from everything else in the universe, and that isolation gives them time to evaluate one another. In studying the planet they've crash landed upon, they see how the other Episode five of The Neron Rising Saga successfully topped the first four episodes, which was difficult to do, because I loved the first four episodes, but top them it did, because Taylor took a step back from the action scenes to let us inside the heart of the story. Shipwrecked, Nova and Valen find themselves physically removed from everything else in the universe, and that isolation gives them time to evaluate one another. In studying the planet they've crash landed upon, they see how the other responds, adapts, and thrives. In studying the ship, they learn the other's aptitude and intelligence as they endeavor to restore power. And in studying each other they learn more about their connection and their ability to fix that which they thought was irreparable in the other. This review has been hidden because it contains spoilers. To view it, click here. So we begin with Nova and Valen marooned on an unknown planet with nothing but the ship they stole and the clothes they’re wearing. Everything looks lost, apart from their lives. Very soon Valen starts exhibiting a strong desire to return, he switches to a nasty horrible person, almost blacking out, so Nova goes on an expedition in his mind to figure out how to get rid of the Kinduri influence planted there. It takes a few goes but he’s free and the weight of it leaves him. During their time on So we begin with Nova and Valen marooned on an unknown planet with nothing but the ship they stole and the clothes they’re wearing. Everything looks lost, apart from their lives. During their time on the planet Nova and Valen become so much closer, clearly falling in love and then making vows to be together always. Nova manages to fix their ship and they hear Arden Black announce there’s been a new Nero found so they decide to leave the planet, to start a revolution!! We leave them here, on the edge of an epic turn in their lives, happy, determined and united. I really enjoyed ‘Nero Nights’. With the focus being mainly on Nova and Valen, we get the opportunity to get to know more about them and watch their relationship deepen into something more meaningful. This was great as their relationship has been a little sparse in previous episodes and we got to see them in full flow. Episode Five was fast paced and I read it in one sitting. I liked the way that Keary moved the saga on but added in lots of detail from the past as subtle reminders to refresh us. I really enjoyed ‘Nero Nights’. With the focus being mainly on Nova and Valen, we get the opportunity to get to know more about them and watch their relationship deepen into something more meaningful. This was great as their relationship has been a little sparse in previous episodes and we got to see them in full flow. Episode Five was fast paced and I read it in one sitting. I liked the way that Keary moved the saga on but added in lots of detail from the past as subtle reminders to refresh us. Nero Blood let my mouth open at its last chapters and I was anxiously waiting for Nero Nights for weeks, I did really have high expectations for this episode and THEY WERE EXCEEDED. Nero Nights was like take a little rest of all the fight and war that is happening in the galaxy to Nova and Valen meet each other better and develop their relationship, and I just love that! And please let's talk about how lovely are Chapters 7 and 8, and how powerful is the last chapter! I just can't wait for Episod Nero Blood let my mouth open at its last chapters and I was anxiously waiting for Nero Nights for weeks, I did really have high expectations for this episode and THEY WERE EXCEEDED. Nero Nights was like take a little rest of all the fight and war that is happening in the galaxy to Nova and Valen meet each other better and develop their relationship, and I just love that! And please let's talk about how lovely are Chapters 7 and 8, and how powerful is the last chapter! I just can't wait for Episode Six! I just can conclude that Keary Taylor writes wonderfully, and I'm so thankful I found this saga! Like I have said before, it has been a long time since a book or saga has had me at the edge of my emotions, but Neron Rising does it every time! After crashing onto an unknown planet, Valen and Nova have to figure out what their next move will be, while also figuring out who they are without any outside influence. Valen has many years of manipulation and lies that he has to come to terms with, and you will see that Nova has her own demons from her past, but together they can figure it out. This episode is so good I blew threw it in a few hours and as always Keary left me wanting more! I loved seeing the character growth throughout the bo After crashing onto an unknown planet, Valen and Nova have to figure out what their next move will be, while also figuring out who they are without any outside influence. Valen has many years of manipulation and lies that he has to come to terms with, and you will see that Nova has her own demons from her past, but together they can figure it out. This review has been hidden because it contains spoilers. To view it, click here. Nora and Valen finally alone and having the opportunity to decide what to do with their lives without the intervention or intrusion of others. Finally able to make the future that they were seeing every night in their dreams their present. But what kind of heroes will leave the galaxy under oppression. Showing a united front they start to rally the galaxy in a way only our two Neros can. Waiting impatiently to read what happens next. This serie is highly addictive. Love every minute of it. Valen and Nova have barely escaped and crashed landed on a planet. While they fixed there ship they finally get some time to get to know each other. Just like everyone else when they first start I can be awkward lol. They have always had great chemistry. But there is still work to be done and they made there choice in what to do. This episode was great to finally see just them. And as always can’t wait for the next. A period of growth is required on any novel, and this episode is the period of growth that was needed. We learn alot about our heroes and about how Nova is coping with the changes going on in her world. I think this might be my favorite episode but then again I've said that about all of these books so far. I am absolutely obsessed even more with the dynamic between Nova and Valen. I'm really happy about the little twist that was added to have Nova and Valen be reinvigorated to join the fight against Cyrillius and the Dominion. This review has been hidden because it contains spoilers. To view it, click here. As always keary has left me begging for more. In this episode we pick up with nova and valen trapped on an uninhabited island and get to read as they connect and find what they have together as well as testing the limits of their ties to dominion. I can not wait for the next obviously. Keep them coming Keary! I hang on your every word! This novella is as good as the last 4. It had me hooked from start to finish. Due to me tending to spoil things I don’t really want to go into too much detail. But let me just tell you that it doesn’t disappoint. It’s a Must read. Keary does an amazing job. Thank you Keary for giving us another amazing book! Most addicting read of 2019! Gets so good and then it’s over and I’m left in suspense until the next release. This is by far one of my favorite series! Keary Taylor is amazing!!! Another great episode. Got a bit into the relationship and now they start a revolution. As the story continues its edge of the seat stuff !!! I can't explain without giving it away I absolutely love this series without a doubt a new fav read !!! Even though Nova and Valen are crashed on a planet there's still a lot going on. They learn more about one another, try to fix the ship and probe into Valen's darkness. Regrouping they make their decision on how to go forward. I would highly recommend this book and series. Keary Taylor is the USA TODAY bestselling author of over twenty novels. She grew up along the foothills of the Rocky Mountains where she started creating imaginary worlds and daring characters who always fell in love. She now splits her time between a tiny island in the Pacific Northwest and Utah, with her husband and their two children. She continues to have an overactive imagination that frequen Keary Taylor is the USA TODAY bestselling author of over twenty novels. She grew up along the foothills of the Rocky Mountains where she started creating imaginary worlds and daring characters who always fell in love. She now splits her time between a tiny island in the Pacific Northwest and Utah, with her husband and their two children. She continues to have an overactive imagination that frequently keeps her up at night. Please Note: Keary does not check Goodreads very often, so the best way to get in contact is directly through email: me@kearytaylor.com.